Cream of Tartar is a common cooking ingredient and can be found in virtually any grocery store. It might even be at your local convenience store as well. A typical size (approx. 1.5 oz or 42 g) container of it will cost around $3 or so. Cream of Tartar can be purchased online, which might be more cost-effective if you need larger quantities than they offer at the supermarket. If you just need a teaspoon or so for a recipe, you’re better off just picking it up at the store. Potassium bitartrate is the scientific name for one of the most common cooking ingredients used today: Cream of Tartar. Potassium bitartrate is a byproduct of winemaking. As the grapes are fermented, a white powder forms inside the wine barrels. Since grapes (and some other fruits) naturally contain a compound called tartaric acid, upon fermentation, this compound reacts with others to produce potassium bitartrate. In addition to being a byproduct, it plays an important chemical role in lowering the pH of the medium during fermentation and acting as a preservative of the wine. It is a fine white powder with a mild smell and a slightly metallic taste. In some recipes, it carries out the same effect that vinegar would do, but without the strong smell or taste. 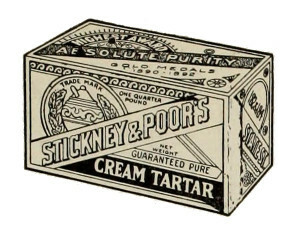 Cream of tartar can be added to foods of all sorts, but is mostly used in the baking industry. The most common and known place you might see it listed in the ingredients is baking powder, which is a mix of baking soda and cream of tartar. Once moistened, this mix adds air (namely carbon dioxide) to the batter, giving the fluffy and light consistency all great bakers seek. When making meringues or any other recipe that calls for whipped eggs, cream of tartar acts as a stabilizer, allowing the delicate egg whites to hold their volume and keep the water and air bubbles, inside the mix, in place. The chemistry of what exactly happens and how this is done is a chemistry lesson on its own! It also helps to enhance the white color of cakes, pastries (when desired) and meringues. The secret to a brilliantly white angel cake is in fact cream of tartar. Be the first to comment on "Cream of Tartar (Potassium Bitartrate)"